A strong earthquake measuring 7.1 on the Richter scale struck central Mexico today, leaving at least 119 people dead in the states of Morelos, Puebla, Mexico and the Mexican capital, which was plunged into chaos by a dozen or so buildings. The quake generated multiple scenes of panic and occurred at 13:14 local time (18.14 GMT), two hours after a simulation commemorating the powerful earthquake of 1985 magnitude 8.1. This time the earthquake in the capital felt more strongly than the one registered last September 7, of magnitude of 8.2 on the Richter scale, given that the epicenter was closer. The earthquake of September 7, the most powerful since 1932 in the country, left 98 dead in the south of the country; 78 in Oaxaca, 16 in Chiapas and 4 in Tabasco. The highest number of deaths in the earthquake today was in the state of Morelos, 54, in Puebla 26, 8 in the state of Mexico and four in the capital, although there are fears that the deaths will increase, since many people are trapped in the collapsed buildings. Rescue and emergency services are actively pursuing people trapped in collapsed buildings, according to the first reports of the authorities. Thousands of people have spontaneously joined to support emergency services in clearing debris from buildings for signs of people who may have been trapped. The scenes of solidarity are repeated in the capital with thousands of people in the streets who do not hide their emotion and fear of repeated new tremors. The electricity supply in the capital was cut off and the Metro stopped servicing the first 30 minutes after the earthquake. Telephone communication services were interrupted by the earthquake and at the moment remain saturated by the high demand for calls. Authorities have asked the population to only use them for emergency and to locate their relatives and to avoid sending photos and videos. Thousands of people walk through the streets of the Mexican capital to try to return to their homes, with most avenues stuck, mainly due to cuts in landslides, such as the colonies Condesa, Del Valle, Narvarte, Centro, Coyoacán and Xochimilco . School classes in the Mexican capital, and the states of Morelos, Puebla and Mexico, have been suspended until further notice. The seismic alert sounded in time and allowed many people to get out of the buildings to shelter in the streets. Civil Protection of Morelos reported “significant damages” in the housing infrastructure, public and historic buildings of the state; and confirmed the collapse of a bridge on the highway from Mexico to Acapulco, and damage to two water treatment plants. Puebla state authorities have so far reported the deaths of 26 people in a school, as well as material damages in several buildings in both the state capital and the city of Cholula. 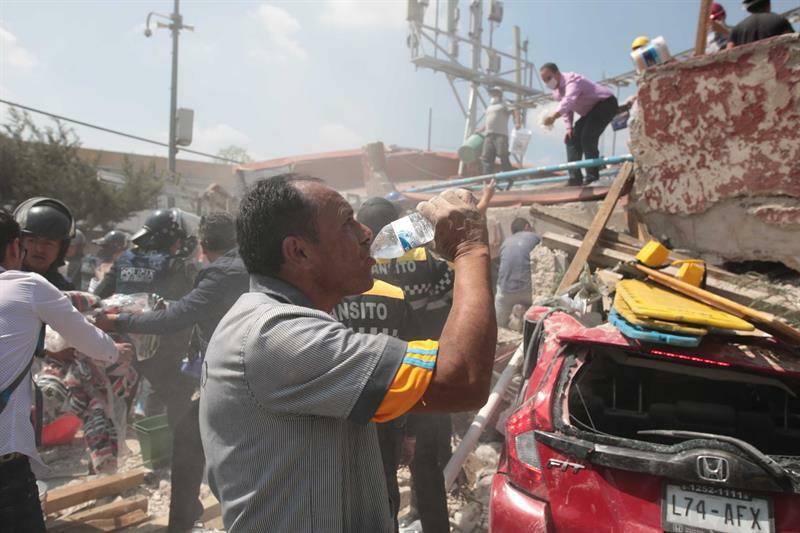 The governor of the State of Mexico, Alfredo del Mazo, reported at least eight deaths and 22 injured in the earthquake. The International Airport of Mexico City has suspended its operations until the conclusion of the review of the entire infrastructure, which has caused dozens of flights have been diverted to nearby terminals such as Toluca and Querétaro. The director of the Mexican Institute of Social Security (Imss), Mikel Arriola, announced the opening of emergency services for the entire population and private hospitals attending emergency rooms at no cost. The earthquake had its epicenter at the border between the states of Puebla and Morelos, 12 kilometers southeast of Axochiapan, Morelos, and 120 kilometers from Mexico City, and the depth was 57 kilometers, according to the National Seismological Service. release.